Dak is back (for now). Since Week 5 Dak Prescott has scored an average of 21.55 fantasy points per week, much of which can be attributed to him running the ball. 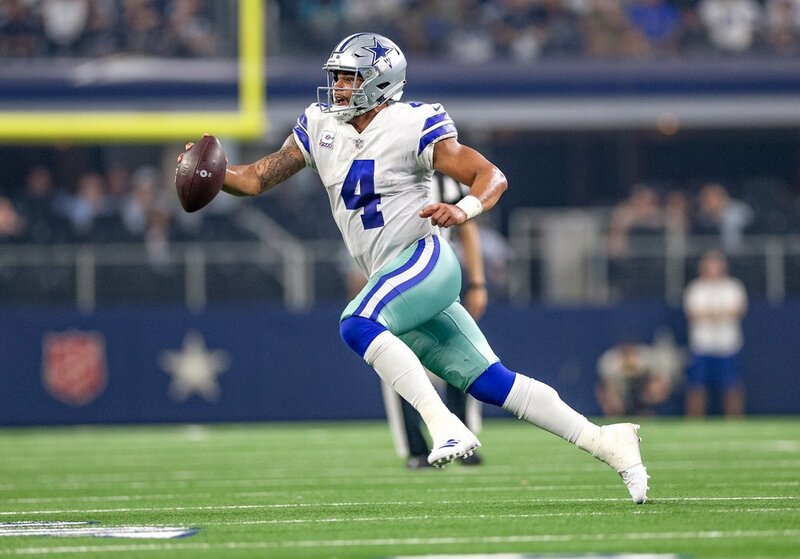 In three out of the last four weeks Prescott has run for a touchdown which significantly increases his floor on a week-to-week basis. This week he faces the Falcons who have been shredded by opposing QBs, allowing an average of 23.7 fantasy points to the position. The offense has started to find its ways and with Zeke running well and Amari Cooper becoming more familiar with the offense by the day, Dak projects to score well over 20 fantasy points in what could be his highest fantasy scoring week of the season so far. Doug Martin has a very favorable matchup against a weak Cardinals run defense and has been receiving double-digit touches in every game since Marshawn Lynch's injury occurred in Week 6. This week, that's extremely valuable with a ton of teams on bye weeks and should be considered a flex or RB2 option at best. The Cardinals defense is giving up an average of 30.1 fantasy points to opposing teams' running backs which is the 4th-most in the league. In 7 out of 9 weeks played so far, the Cardinals defense has given up at least 1 touchdown, and out of those 7 games they've allowed multi-TD games in three of those. If the Raiders want to have much success against the Cardinals this week they must effectively establish the run and if they are able to, Martin could be in for a great day. The last time John Brown played against the Bengals in Week 2, he exploded for 19.2 fantasy points. Brown has disappointed lately, not accumulating over 3 catches or 6 fantasy points over the past two weeks, but should rebound versus a very vulnerable defense that is still giving up big points to the WR position. The defense has allowed 6 touchdown passes over its past four games, and is giving up an average of 42.7 fantasy points to opposing team's' wide receivers this season. With another 6 teams on a bye this week, Brown has tremendous upside, regardless of who the quarterback on this team ends up being on Sunday. With George Kittle, David Njoku, and Rob Gronkowski all on byes this week, many owners will be looking for that waiver wire pickup that can take them to the next level this week. Ricky Seals-Jones presents as a sneaky play with upside who is going up against a terrible defense in the Raiders that cannot stop the tight end position. The defense is allowing the second most fantasy points to opposing team's tight ends (14.4) and has allowed 4 touchdowns over the past 3 games. David Johnson isn't the only one in the offense that has an increasing role, as RSJ last week posted a season-high in catches (5) while scoring double-digit fantasy points in the process. Cairo Santos scored 19 fantasy points over the two games he subbed in for an injured Greg Zuerlein over in Los Angeles and now replaces Chandler Catanzaro as Tampa Bay's full-time kicker. This week the Buccaneers play against the Giants who are giving up an average of over 12 fantasy points to the position, and the lowest a kicker has scored against them is 8 fantasy points - I'd say that's safe! This week the Arizona Cardinals Defense are at home against the Oakland Raiders and have the lowest implied game total of the week. This game isn't going to get out of hand and the Raiders are allowing opposing defenses to score the 7th-most fantasy points against them, an average of 8.0 per week. If the Raiders cannot get the run going with Doug Martin and are forced to air it out, watch for Chandler Jones and the Cardinals pass rush to disrupt Derek Carr and force him into a few mistakes. In Kirk Cousins' last game before the bye week, he had his worst game of the season, scoring only 6.4 fantasy points in a divisional game against the Lions. This week the Vikings travel to Chicago to play against a Bears defense that recently got back pass rusher Khalil Mack. Cousins has been sacked 24 times through 10 games which is tied for 9th most in the league, which doesn't set up well on Sunday Night Football. While the Vikings could pull away late in this game I wouldn't expect Cousins to surpass 20 fantasy points this week, which is worthy of a sit this week with better options on the waiver wire. Owners must be upset when Jordan Howard doesn't produce even when he has a favorable game script against weaker teams this season. This week, I wouldn't expect much to change, except the Bears now play against the Vikings who've allowed only one team to surpass 108 yards rushing and have only surrendered 2 rushing touchdowns in 9 games. In a game where they are not favored, Jordan Howard could see limited touches again for the second week in a row and see Tarik Cohen have increased touches and have more value in the offense. Similar to my start of the week John Brown, Bengals' Tyler Boyd crushed the Ravens for 6-91-1 in Week 2, however, their situations are a little bit different now. AJ Green hasn't practiced this week so far and could potentially miss this week's matchup. If Green doesn't play and Boyd comes into the game as the primary pass catcher, that could be a problem once again. Since the aforementioned game in Week 2, the Ravens defense has only given up 4 total touchdowns to opposing team's wide receivers. Pair this with the fact that Boyd has yet to prove he can fill the role as the number one pass catcher on the team and he is a risky start this week, even with the amount of fantasy relevant wide receivers on a bye. In a week where owners may need to make a decision on which free agent tight end to pick up and start for one game, Jared Cook should be an afterthought. Cook has had a couple of productive games lately, however, his matchup this week does not make starting him appealing in the slightest. The Cardinals defense hasn't allowed a TD since Week 2 and are allowing the 7th fewest fantasy points to position per week (9.3). Teams who face the Cardinals understand their weakness is against the run and find other ways to beat them which, more often than not, does not involve heavily targeting the tight end. The Washington Redskins are allowing under 5 fantasy points to kickers through nine weeks, and this doesn't bode well for the 7th-ranked kicker in the league, Ka'imi Fairbairn. The Texans/Redskins game has the second lowest game total of the week in which should be a defensive, low-scoring affair. Fairbairn has been a solid fantasy option this year however he may disappoint owners this week given the tough matchup. The Los Angeles Rams defense is currently ranked 5th in the league, so why should you be sitting them? Now that the game is out of Mexico and back in LA, the game will be all systems go come Monday Night Football. The game has an implied total of 63.5, which is insanely high! There won't be much defense in this game and it should be a back and forth offensive battle between two Super Bowl contenders. It's time to bench the Rams in favor of another defense with a much better matchup.